August 19: What's Jen Clicking on Between Newscasts? I've been following this story for a few days: a pack of feral dogs in Georgia turns on a neighborhood woman out searching for one of her own dogs. Her husband, out looking for her later in the car, also is attacked as he apparently finds a piece of her bloody, torn clothing in the road. Sherry Schweder, who often would take her pets along the road, had gone out for a walk sometime late last week when she got attacked, he said. Smith believes her husband, worried that she had not returned home, took the couple's Honda sedan and drove down the road looking for her. The dogs attacked him when he found her and got out of the car, Smith said. Their bodies lay on either side of the road next to the car before visiting Jehovah's Witnesses found them Saturday morning. Authorities said little during the early stages of the investigation. "We did not know what we had at first because the bodies were so mutilated," Smith said. "We wanted to thoroughly investigate what happened." A shredded piece of shirt, some strands of hair and bloodstained dirt were all that remained Tuesday where the couple was killed. Paramedics who came to the grisly scene Saturday morning found the suspected attackers standing guard. While it's unclear exactly what happened because there were no witnesses, officials have rounded up 16 dogs they believe were involved. 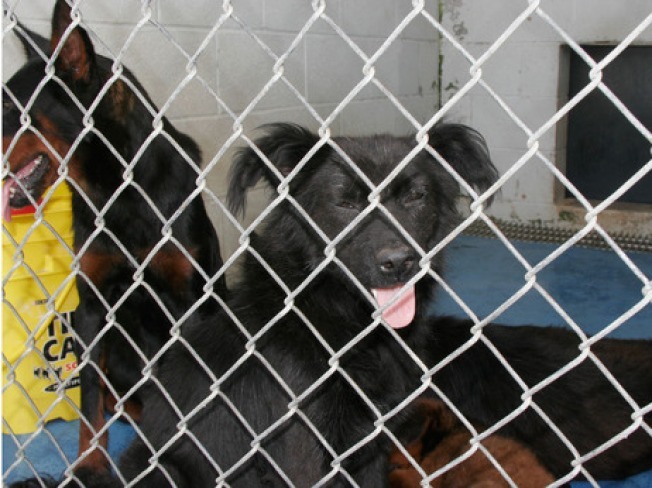 Schweder had told one of her sons that no one seemed to be caring for the dogs, said Jim Fullington, special agent for the Georgia Bureau of Investigation. Experts say the attack is extremely rare — so rare "you are more likely to be killed by a bolt of lightning than by a dog," said Adam Goldfarb, a spokesman for the Humane Society of the United States. The dogs didn't belong to anyone, but a man who owns a house at the end of the road had been feeding them, said Oglethorpe County sheriff's Capt. Shalon Huff. The man told authorities the dogs never behaved aggressively toward him, and he did not believe the dogs had killed the couple. I did a story about 10 years ago about stray dogs roaming the streets of Los Angeles; there were, at the time, an estimated 44,000 of them. We would see them galloping through inner city neighborhoods before dawn when I was out reporting, and we'd scatter like bowling pins when they'd come our way, running for cover. I once bailed into the bed of a pickup truck parked near me, dogs nipping at my heels as I made my getaway. 1. Take precautions against dog attacks. Most dog attacks are the result of insufficient containment of the dog, or poor training. I.e. Bad owners. Unfortunately, the world will never be rid of bad owners, so it is wise to be prepared. 2. Look for warning signs. Most dogs are not aggressive but rather just curious or defending what they perceive as their territory. It is important to be able to tell if a dog is just playing or is being truly aggressive. While some breeds have been singled out as being particularly vicious (pit bulls, Rottweilers, Presa Canarios and their mixes (ref removed by wikihow spam filter, if you can put it back please do so) any mid-size and large dog breed can be dangerous (poodles, terriers) so do not ignore warning signs because you think a certain breed is harmless or friendly. If the dog approaches you with its head held high or low, it is probably not going to attack. A dog whose head is level means business. A loping gait means the dog is playful and checking you out. An even, steady run means business. Control the situation. Remember that most dogs are in subjugation to humans. A commanding "Down!" or "Go Home!" may stop an attack momentarily, giving you time to back away. Never Run. Running away can awaken the dog's prey instinct to chase and catch animals, and he may pursue you vigorously even if its initial intent was just playful. In addition, you won't be able to outrun a dog if you're on foot. Even if you are on a bicycle you usually will not be able to outrun a dog. Assume a non-threatening position. Dogs will assume that you are poised to attack them if you face them head on and make eye contact. Standing sideways to the dog and keeping the dog in your peripheral vision instead of facing them and making eye contact, will signal to the dog that you are not a threat. If you can, fold your arms tightly to protect hands. If this cannot be effected without making sudden movements, keep your arms flat and still by your sides with clenched fists to protect fingers. In dog pack behavior, turning away does not indicate that you are submissive, but rather not positioned to attack the dog. Hold your position. Dogs have short attention spans. Often after some barking, the dog will lose interest and go away. Do not appear threatening to the dog, and don't open your hands and arms up to a bite by extending them. Keep your fingers curled into fists to avoid getting them bitten. The dog may come quite close, even sniffing you, without actually biting. 4. Curl into a fetal position if there is no way to avoid the physical attack. Use your arms and hands to protect your face and neck, and curl up in a ball. Remain motionless and don't scream. Dogs will almost always lose interest in you if you remain still. Wait until the dog leaves the area before getting up. If you stay still and protect your face, chest, and throat, the dog will only be able to inflict puncture wounds on areas of your body that have thicker skin. If the dog is biting, the last thing you want to do is struggle or pull away, as this can cause open, torn wounds. If the dog is biting someone else, do not pull the victim away for the very same reason. Find a large stick and strike the dog across the back of the neck. You could also try to force a long object or your arm horizontally in the dog's mouth. Push it in forcefully towards the throat to minimize damage to yourself. If you have time, wrap your arm in a shirt or jacket first. Don't hit a dog on the head as they generally have very thick skulls and you will only make it angry. The only place to hit a huge dog that will have an effect is across the back of the neck near the base of the skull or across the sensitive nose. This may not be useful in self defense but may be used if a partner is being attacked. If the dog attacks your dog, let go of the leash and do not interfere. Learn how to break up a dog fight. 5. Back away slowly and leave the area once the dog loses interest in you.Staying calm and stationary can be a real test of your nerves in this situation, but it's the best thing to do as long as the dog isn't actually biting you. I'm working on a story for Monday morning right now about dog body language. Do you think as long as a dog is wagging its tail, it's friendly? Not so, says our dog expert. I'll post it here next week.